Spend your holidays with Historic Columbia. The season officially kicks-off at Historic Columbia on Friday, Nov. 16 – with historic holiday festivities taking place through Sunday, Dec. 30. Take holiday tours of the Robert Mills House and the Hampton-Preston Mansion, enjoy holiday-themed special events, visit with Santa, find the perfect gift at the Gift Shop and rent a historic property for your holiday event. 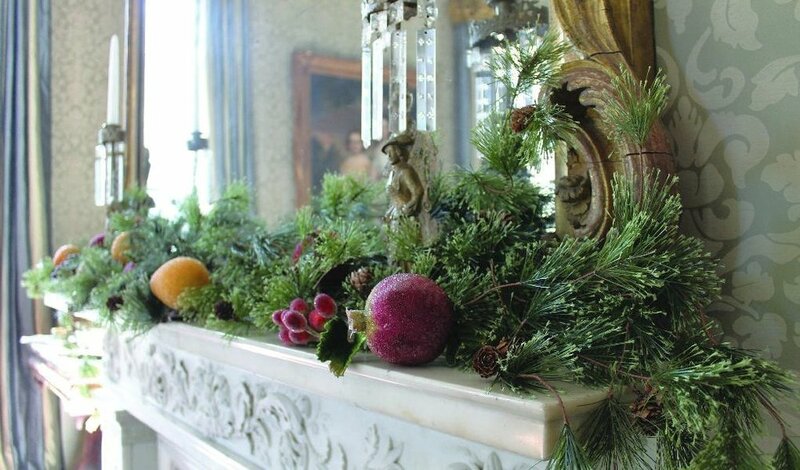 Historic Columbia kicks-off the holiday season on Friday, Nov. 16, with holiday tours of the Robert Mills House and the Hampton-Preston Mansion. Guests are invited to see a variety of holiday decorations and experience traditions in both historic homes through Sunday, Dec. 30. Tour guides provide stories of holidays past in Columbia and discuss how families decorated and entertained during the 19th and early 20th centuries. To schedule a group tour, call 803.252.1770 x 23 or email reservations@historiccolumbia.org. Visit the decorated, candlelit halls of the Hampton-Preston Mansion and the Robert Mills House and on a guided tour on Friday, Dec. 14. Enjoy live music entertainment and children’s activities while celebrating the holidays with Historic Columbia. Before or after your house tour, take a carriage ride through the Robert Mills Historic District. Stop by the Gift Shop’s holiday open house throughout the evening for a last-minute storewide sale as well as refreshments, holiday tunes and giveaways. To schedule a group tour, call 803.252.1770 x 23 or email reservations@historiccolumbia.org. Breakfast with Santa - Saturday Dec. 15 from 8 -11 a.m.
Join Historic Columbia for a holiday treat to remember! Enjoy a continental Breakfast with Santa in the cozy Robert Mills Carriage House while listening to seasonal music. After your meal, guests can view the decorated halls of the Hampton-Preston Mansion, see a Victorian Christmas tree, make holiday crafts to take home, and take a picture with Santa! While Santa is hard at work gathering lists, the Gift Shop elves will also be hard at work providing great values on purchases. Enjoy shopping and activities throughout the day at the Gift Shop. Breakfast with Santa is $7/youth and $15/adults for members, $10/youth and $20/adults for non-members and free for kids 3 and under. Please note: This year, Breakfast with Santa participants will choose a specific breakfast time of 8, 9 or 10 a.m. Space is limited and guests should purchase tickets in advance by visiting historiccolumbia.org, calling (803)-252-1770 x 23 or emailing reservations@historiccolumbia.org.